Johnny O’Keefe, Graham Kennedy, Bobby Limb and Stuart Wagstaff, shirtless on the first Telethon in 1968 Well before the Perth Convention and Exhibition Centre, the Esplanade Train Station and the Transperth City Busport, or the car park on the corner of Mounts Bay Road and William Street, there existed on the same site a fairground called White City, which was established by a charitable group called the Ugly Men’s Voluntary Workers Association. 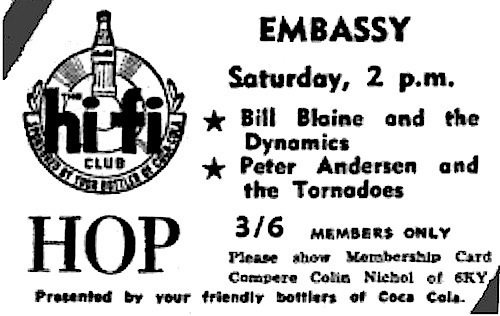 …These bands made guest appearances on the Perth show, where Bill Blaine and the Dynamics were the house band. 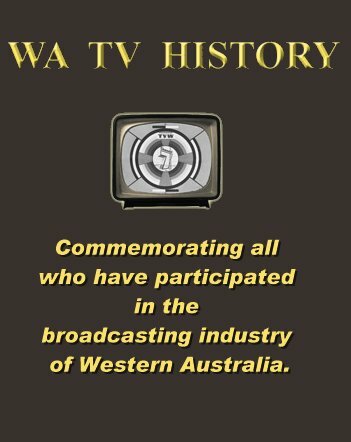 Coca Cola Hi Fi Club Hops at the Embassy (Courtesy of Colin Nichol) Coca-Cola’ subsidiary Gest (Golden West Soft Drinks) also sponsored the Club 7 Teen teenage shows on TVW Channel 7 which were hosted by Gary Carvolth from 1963 to 1964, then by Johnny Young.